Connect IDX Broker with a variety of third party CRMs or other web services with the help of Zapier. IDX Broker has a 'zap' called IDX Leads that can easily send your leads to another service for you to manage. 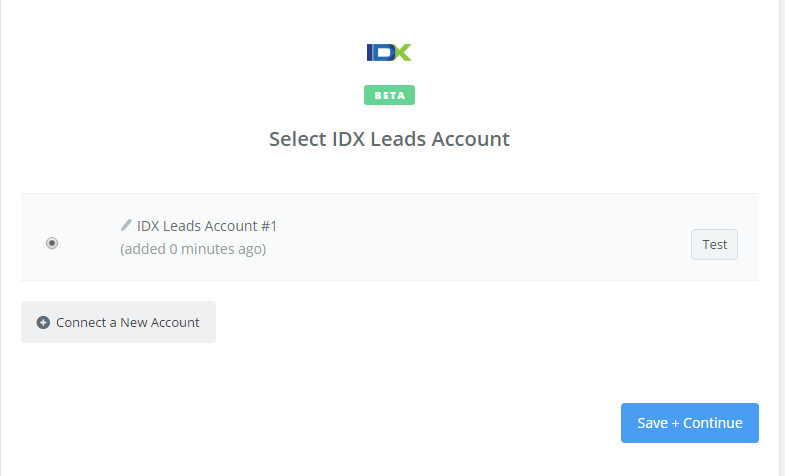 To get started with IDX Leads on Zapier, first you will need to connect your IDX Broker account to use with your Zap. Click the Make a New Zap button. In the Trigger Service dropdown, choose IDX Leads, and choose New Lead as the trigger. Then click the Save + Continue button. In the Action Service dropdown, choose a service to send your IDX Leads data to. Next, you'll be asked to enter your IDX Broker API key. Log in to your IDX Broker account and navigate to Home -> Access Control. Copy the entire green text. Paste your key back into your Zapier account and then click the big orange Yes, Continue button. If your API key was entered correctly your IDX Leads account will now be successfully connected. Test this implementation by clicking Test. Make sure that you have at least one lead in IDX Broker and then click Fetch & Continue. If you do not want to create your own test lead, click Skip Test & Continue. Now that the IDX Leads zap is set up, it needs to be connected to a CRM or other web service to accept the leads pushed from IDX Broker. An action app, like your CRM, will receive new leads (as available) every 15 min. Start your first Zap, now at Zapier.com and search for IDX Leads or select one of the quick starts here. If you attempt to pull in thousands of leads at once, this may time out the system.